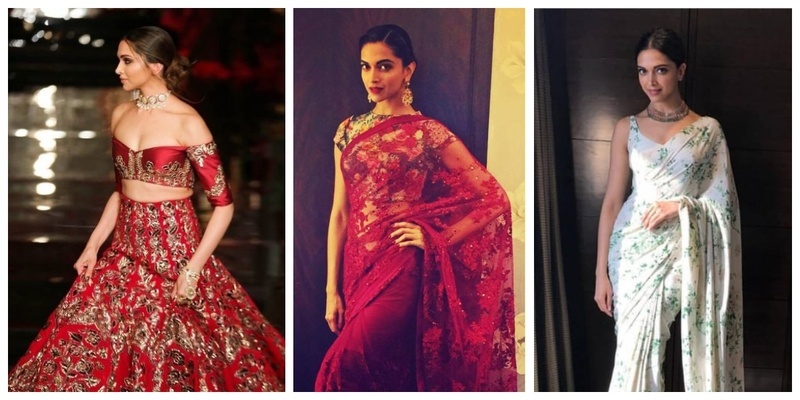 10 lehenga and saree looks on Deepika Padukone which should be on every bridesmaid's shortlist! Glam-girl Deepika doesn’t really need an introduction because her ethereal beauty and charismatic style speak for itself! This celebrity star’s elegance is one of a kind and she leaves no stone unturned when it comes to giving serious #stylegoals. 2. The gorgeous off-shoulder pastel gown with pretty frills! 4. Rule the dance floor on your BFF’s sangeet in a gorgeous golden and royal blue outfit like this! 8. The stunning pastel saree gown that gives regal vibes! 9. Glittery saree for the starry sangeet night! 10. A beautiful floral saree for a simple and sophisticated look! So, bridesmaids, I hope you were able to get some outfit ideas for your BFF’s wedding!